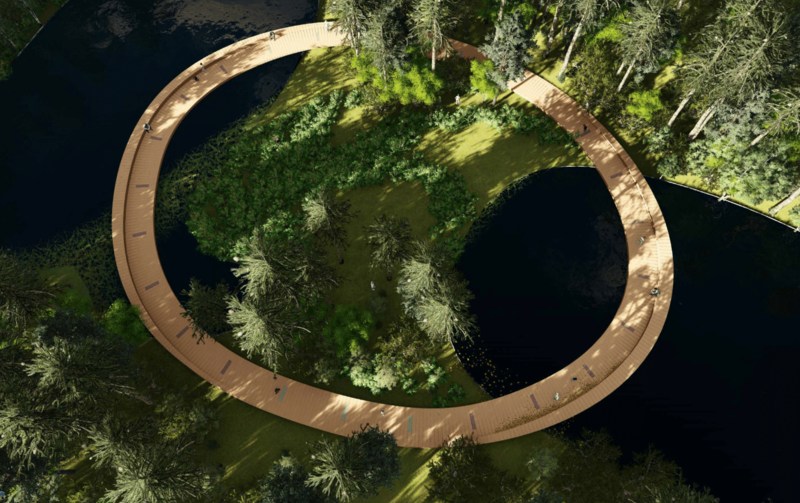 The following images are selections from the finalists' designs. 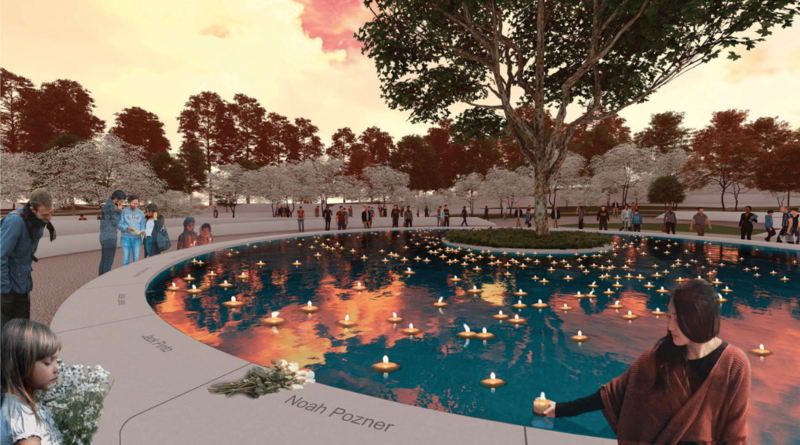 Above is a rendering of the Candlelight Memorial at the Sacred Sycamore. 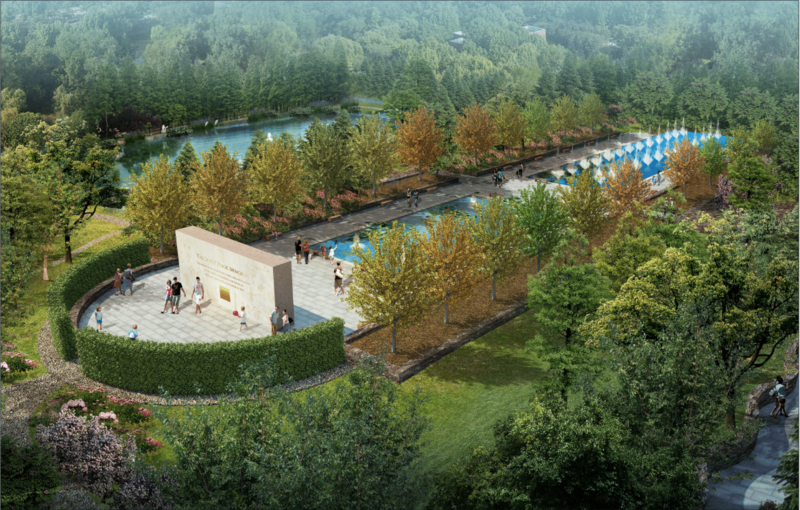 The Memorial Grove, with restored woodlands and ponds at back. Forest Memories, described as a "landscape that remembers." One finalist's inspiration for its submission. 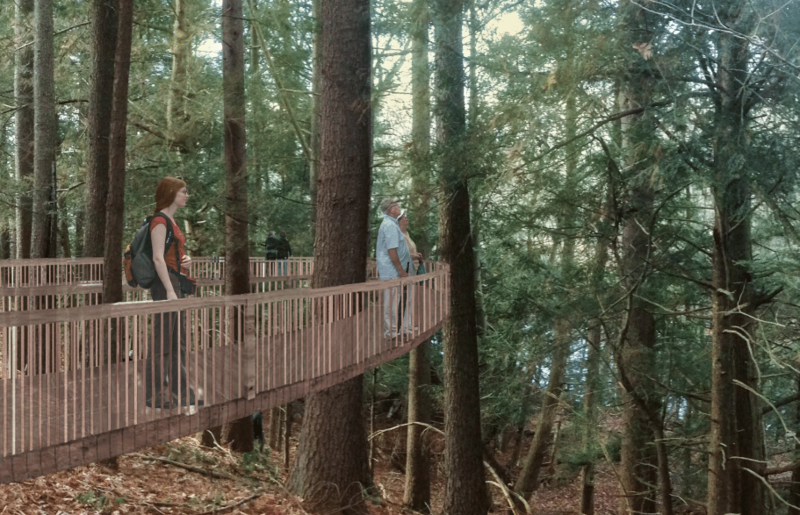 Skywalk in the Sandy Hook Sanctuary. 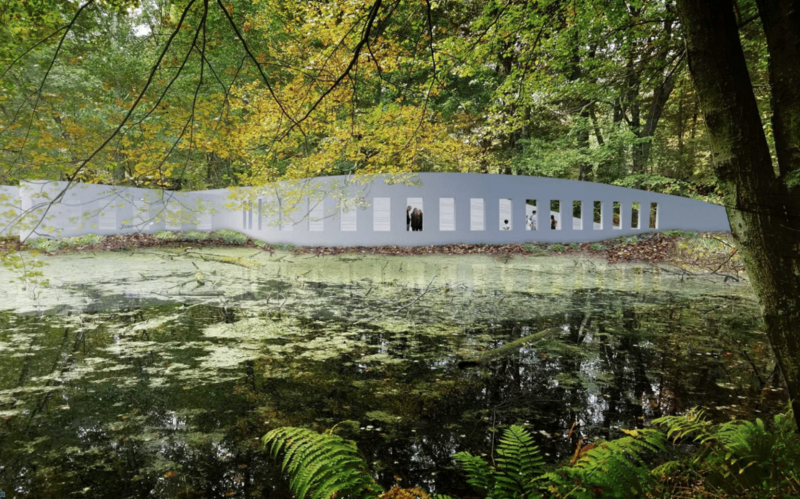 Rendering of the Sacred Sycamore with dogwoods, as it would be experienced in winter. Memorial from a bird's eye perspective. Exterior perspective of the Wall Memorial. Children's Gardens as part of the Sandy Hook Memorial Gardens. Below is a transcript of their conversation. So tell me a little about this Commission and the journey you’ve been on so far. What has the journey been like for you? So we’ve come to appreciate the process. People have pushed us and asked us, “You know, why is it taking so long?” And one of the answers we give is, we want to get this right. You know, we’re not in a rush. This is something that’s going to live on forever. Let’s get this right. The next step is what is going to be on here, what is this going to look like. So I understand now we’re seeing for the first time, we’re seeing some of these potential designs. Tell me a little bit about some of these. We wanted to open it up to individuals to submit designs. Some people were local, some people were across the world. Literally, I think we had about 14 to 16 countries that were represented. We did create guidelines for submitting a design. You know, making sure we weren’t honoring the event, but honoring the individuals that were lost. This being something that was live in December, in the winter, knowing that the tragedy happened in the winter, would flowers and plants be something that are realistic? We wanted to make sure that when people visited in December, it’s something that isn’t dull, cold or dark. Ultimately, we received 188 designs back to our Commission, and some of these designs that we have looked at have just been…a few of them have stopped us in our tracks a little bit. And that is ultimately what we were trying to accomplish. Are there some general themes, general visions that you see running through these? The land specifically, as I mentioned, is a beautiful five-acre land. It has an upper field, a lower field and two ponds on the land. So a lot of the designs incorporated designs within the water specifically. We were, I think, impressed by the way, the different ways, that people used the water specifically to share their thoughts. But every design we looked at, we wanted to make sure there was a memorial component that honored the lives…that is our mission statement. And making sure there was a way, it wasn’t just a, you know, generic park, a gathering place. It was a destination. What is the emotion when someone goes to a memorial? Is it sadness or is it hopeful? We know that each individual is different. One of the designs in particular, and this is no bias, it was just different, was that there was a real representation of the hurt, the darkness, of that day. And while a lot of the designs celebrated and honored the individuals, which was our ask, there were a few that came back with the scars that were felt. Yeah, we wanted to be very cautious about who we were approaching, the questions that were being asked. The group at the forefront of every single discussion that we’re having is the 26 families. While there were things that happened directly after the tragedy spontaneously and all with good heart – you can’t doubt any of that, I truly believe that – not every family is going to have the same opinion, not every family is going to have the same emotion or at the same stage. You know, we wanted to be sure that there was a true liaison from our Commission to all of the families, ensuring they’re involved in the process, if they wanted to be involved in the process, our arms are wide open to their participation. So what is next for the process? So the 13 designs we’ll now pass off to the 26 families specifically. They’ll be able to provide feedback in person, have say in a specific design. Community members around the location…we’re open to that as well. A memorial is forever. The design that you choose, what do you hope it gives the Town, not just in the days and weeks after you unveil it, but for generations? 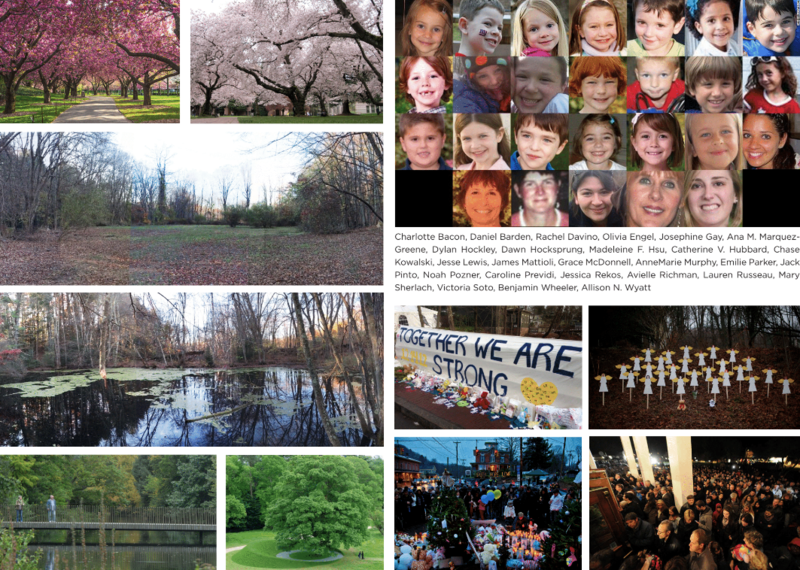 We’re hopeful that it’s something that remembers every single life that was lost. Our mission statement, literally since the first meeting that we met, making sure that whatever we’re creating honors these 26 lives lost. So as long as we do that, I think we’ve done our job. Every decision we’ve made, literally, we’ve kind of given ourselves a gut check. Does this decision honor the lives lost? And I think that’s kind of what's guided us through this entire process.